8 Jun 2017 Washington D.C.
On Thursday, former FBI chief James Comey testified before the Senate Intelligence Committee over his conversations with President Donald Trump. But, when it came time for John McCain to jump in, his questions came off disjointed and practically insensible. Now the senator from Arizona is blaming the Diamondback/Padres game for his odd performance. McCain started his allotted time haltingly speaking about Hillary Clinton and how Director Comey ultimately decided she was “careless” with her email server but that there was no reason to pursue her for breaking America’s security laws. He then segued into what the Director was investigating about President Trump. Comey had a bit of trouble following the Senator’s question and noted that his investigation of Hillary was completed and that is why he made his announcement about its outcome in that case. But, the investigation into potential Russian intervention in the 2016 election had barely begun before he was fired, so he didn’t have anything on it to report. Still, McCain found some sort of dichotomy between deciding there was no reason to investigate Hillary, and still finding reasons to investigate the Russia meddling. McCain couldn’t seem to clearly convey what he wanted Comey to answer to and at one point Comey admitted he was “a little confused” and just wasn’t following McCain’s question. It seemed that McCain was trying to hint that the FBI gave short shrift to the investigation into Hillary while needlessly drawing out the investigation into any Russian meddling in the 2016 election. 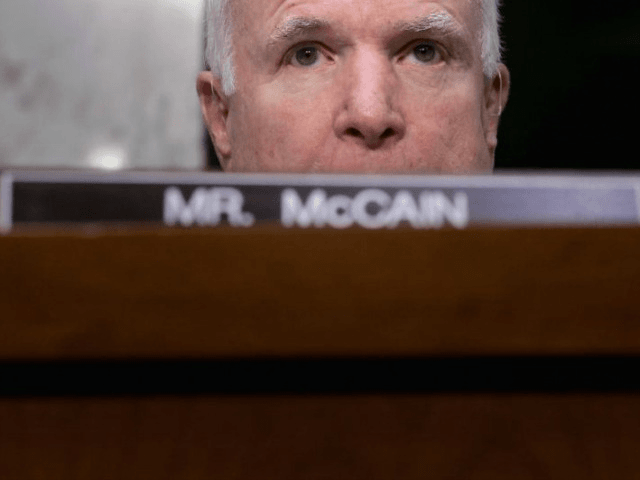 But, it wasn’t very clear, and for sure McCain looked very tired and unfocused during his time at the microphone. The Internet went wild over McCain’s disjointed questioning, so much so that the Senator’s office felt the need to explain why McCain was so muddled. It turns out it was Major League Baseball’s fault. Just before 3 p.m. Washington time, McCain pushed out a press release explaining his seeming fatigue during his time to ask questions. What I was trying to get at was whether Mr. Comey believes that any of his interactions with the President rise to the level of obstruction of justice. In the case of Secretary Clinton’s emails, Mr. Comey was willing to step beyond his role as an investigator and state his belief about what ‘no reasonable prosecutor’ would conclude about the evidence. I wanted Mr. Comey to apply the same approach to the key question surrounding his interactions with President Trump—whether or not the President’s conduct constitutes obstruction of justice. While I missed an opportunity in today’s hearing, I still believe this question is important, and I intend to submit it in writing to Mr. Comey for the record. If Comey’s testimony was any indication, he probably could not have answered Sen. McCain’s points anyway, because from what he said that morning he didn’t seem to be much involved in the ongoing investigation into Russian interference in the election before he was fired. Still, if McCain did stay up until the end of the game, he would not have gotten to bed until one thirty in the morning, according to NBC Sports. Ultimately, after almost four grueling hours, the DBacks brought the game to a close, beating the Padres 7 to 4.